For this tournament season we are happy to announce that we will be adding video content to the website. All video content will be posted both to the website and our YouTube channel. Even if you plan on viewing video content through our website, it still helps us out a lot if you subscribe to the channel on YouTube as getting to 1,000 subscribers will open us up to review for additional features and monetization on the YouTube platform. The first video series we will be producing for this season is called Road to Worlds 2k19 a series in which I go over my 2018-2019 tournament season, covering the decks I played and how my tournaments played out. After every tournament I go to, you can expect a new episode in this series. In the first episode, I go over the Lucario GX deck I used at the Yeti Gaming League Challenge. This tournament was played in the BREAKthrough to Forbidden Light Standard format, but the deck still seems like it could be good in the World Championship format. After getting the video together, I realized that I neglected to talk about the Buzzwole matchup in the matchups section of the video. It was the second deck I had written down to talk about, but somehow I managed to skip over it and go straight onto Malamar. The Buzzwole matchup has been very favorable in my testing, regardless of whether its a GX heavy list, a Baby Buzzwole focused list, or the Buzzwole GX/Garbodor deck. I think what makes the matchup so favorable is that Baby Buzzwole does not OHKO a Lucario GX with Sledgehammer or a Swing Around with two heads. Both attacks do 120 damage, so with the best case scenario of a Beast Energy, Choice Band, and Diancie Prism Star, they are still only doing 200 damage, 10 short of taking the OHKO on a Luacrio GX. They can setup the knockout with Buzzwole GX, but that means they attacked with Buzzwole GX and we can attack with Lucario GX and OHKO it for two prizes. Buzzwole GX, however, can take a OHKO on Lucario GX, but it needs three Energy to do it, while we only need one Strong Energy to do it with Lucario GX, making the investment to get to the OHKO much less for us. Our Baby Buzzwole also can OHKO their Buzzwole GX, allowing us to use Baby Buzzwole to prize gain on them, while they can’t quite use their Baby Buzzwole to do the same to us because of Lucario GX’s superior 210 HP. 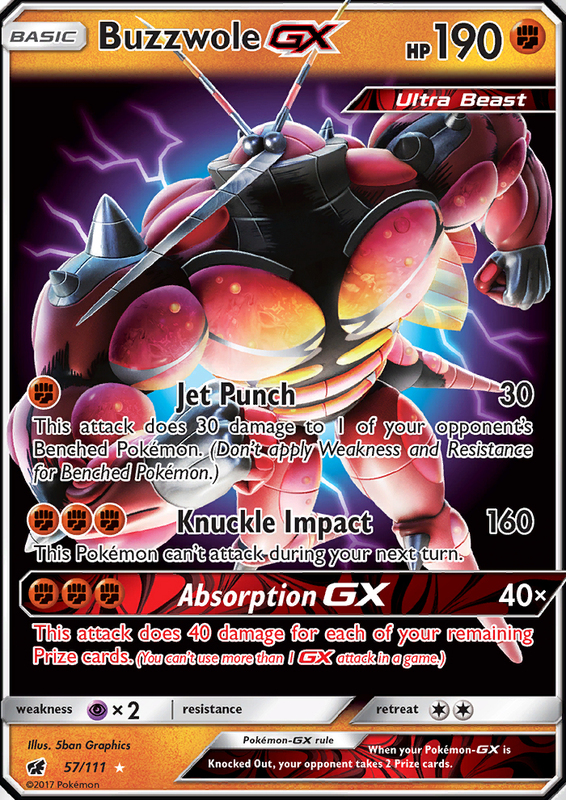 The Buzzwole GX/Garbodor deck built around Order Pad and Beast Ring does have Fighting Fury Belt, but this deck is so slow that this doesn’t matter and you can spread with your Buzzwole GX in the early game to set up their Pokemon for knockouts. As they don’t play Max Elixir, they have no means to seriously pressure you in the early game. An older Buzzwole GX/Garbodor deck, playing Max Elixir, could pose a greater threat. Great articles. Keep up the good work. I will be back more often!